Frederic Chiu and Andrew Russo aren’t a full-time piano duo team. (Russo isn’t even a full-time pianist.) But they have played together before, including a previous appearance in the Maverick series. On Saturday, August 29, they played a solo each and two large works in collaboration, one unsatisfactory, the other a triumph. Schubert’s Divertissement à la Hongroise began the program. Even among Schubert’s works for piano duo, not the most explored area of his music these days, it’s a relatively obscure piece. Frankly, although it was published in his lifetime, and it was recorded on 78s by Artur and Karl Ulrich Schnabel, it’s not one of Schubert’s masterpieces. Half an hour long, its charms tend to vaporize as it progresses. There seems to be an interpretive consensus today about playing Schubert on the piano, that even at the most dramatic moments or the strongest dynamic contrasts, the pianist’s tone should always be mellow. Chiu and Russo kept the piece moving, but their wide dynamic range often led to edgy, clangy tone, especially from Russo (who was playing the primo part). Russo’s solo performance of Charles Tomlinson Griffes’s Three Tone Pictures showed better tonal manners, but there was still some clang at fortissimo. Griffes isn’t getting the respect he deserves these days; he was an American innovator and a composer of serious talent. These three little pieces aren’t as adventurous as Griffes’s great Piano Sonata, but they’re fascinating as examples of early American impressionism. Overall I felt Russo did them justice. 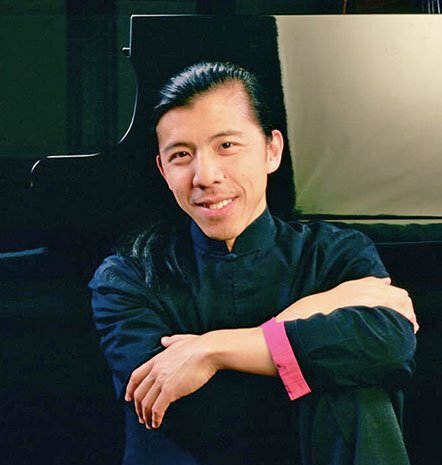 Chiu is something of a Prokofiev specialist and has recorded the composer’s complete piano works. He gave us a real treat by playing the complete “Visions fugitives,” some of Prokofiev’s most imaginative piano music–and certainly his most concise, 20 miniatures averaging a minute each. I remember hearing a disc of Chiu playing Prokofiev Sonatas years ago and finding it too mild-tempered, but this performance was just right. After intermission, Chiu and Russo returned, parts reversed (Chiu as primo), for the piano four hands version of Le sacre du printemps which Stravinsky apparently prepared for ballet rehearsals and previews. It’s not exactly a novelty but it doesn’t get played very often. What’s left when you lose all that gorgeous orchestral color? Quite a bit, as it happens; all the rhythmic power, the clash and clang of the musical barbarism, the biting dissonances. I’m still trying to figure out whether some harsh tone just suited this music better than the Schubert, or whether–as I suspected at the time–the playing just didn’t have any edgy tone to it. Whatever the cause of the difference, I was never troubled by the piano sound in this consistently exciting performance. It seemed the pianists were actually producing more tonal variety than they had in the Schubert. I’ve never studied the orchestral score of this work, but I think the sound of it is pretty well ingrained in my memory after half a century of listening to it. So I think I’m safe in concluding that this performance, in addition to being full of impulse and excitement, was also very accurate. It was a compelling, thrilling experience, and the full house reacted with the kind of enthusiasm it deserved. Leslie Gerber’s unmannered and frank write-up of this Russo-Chiu four-hands evening is a pleasure to read, both for its evaluative credibility and for its welcome dearth of pretence. As a reader, I feel well informed about what happened. With one exception. This long after the sad disappearance of sonic and expressive variety among modern grands, it’s no longer customary to credit pianos. When I read that the duo pianists’ “wide dynamic range often led to edgy, clangy tone” in the Schubert, and that “I’m still trying to figure out whether some harsh tone just suited this music better than the Schubert, or whether….the playing just didn’t have any edgy tone to it”, I roll my eyes at a familiar situation. The assumption, naturally, is that the instrument itself is beyond question: The piano’s a given, incapable of individual character. We no doubt suspect what name was on the fallboard of the Woodstock piano, and even which of the maker’s two factories produced it. The unwritten assertion, in any event, is that there is no other option. With that I humbly, firmly take issue. I appreciate and deeply envy the richness, diversity, and wide range of timbral and expressive options once (pre-1938 World Fair?) common on all the stages of the world. Up to then, Steinway competed with Mason & Hamlin (which, by the way, cost more) and Chickering. Further afield, Bechstein, Blüthner, Erard, and Bösendorfer owned select stages and did vigorous battle with the other makers for primacy. We – listeners, performers, composers – were winners in this benignly Darwinian organological rivalry. Once more – yet again, encore une fois, schon wieder – I’d like to suggest to our reviewing and writing colleagues that, when lauds and aspersions are on the menu, the role of the instrument involved is, often enough, on a par with what the musicians were up to. Clangor is as likely to come from a harsh piano and dry, hard acoustics as from ten foreceful digits. Yes….? Our bland assumption that pianos are all the same tool and that they bring identical resources to bear denies a dimension of public music making that our ancestors reveled in. As do I, or would like to be able to more often. Please, then, let’s do away with instrument anonymity. Being aware of this forgotten dimension of music making greatly enriches us. Many of the comments are interesting too. Pianos that go to concert halls or high-profile clients get the attentions of a voicer, but as I understand it others are sent out really just half-voiced, and the work is not always done by the real pros. Steinway’s excuse is that they don’t know what kind of room it’s going to be in so they can’t really voice it appropriately. But obviously they know most will go to livingrooms or practice rooms and could voice for that. Maverick’s Yamaha is as un-harsh as the unusual hall is acoustically perfect for chamber music. Clanging there comes from practitioners.